Yesterday Kravet hosted a Social Media Event for Designers and Decorators out of the Designers Walk Resource Centre. Jennifer Powell, Kravet's Social Media Coordinator from NYC opened the morning with an overview of how important FB, Twitter, LinkedIn & Blogging are in the business of design. I've been tweeting (off and on) for a couple of years and blogging for a few years but I still took away some valuable information. After Jennifer's presentation Toronto Designers Meredith Heron and Lisa Ferguson joined her on stage for a panel discussion on Social Media. I'll go out on a limb here and say every single person in the room realized the potential boost social media can bring to their business after hearing Meredith and Lisa's excellent examples of how they've personally benefited. As dry as it all sounds, it was all about social media after all and not one Kravet fabric was seen, it was a ton of fun and there where many laughs...at and with Meredith. Teasing Meredith...we all stalk admire Stephen Drucker! I wanted to thank Kravet for the great day but wasn't sure how until I saw the pillow at the top of this post. The board above is inspired by the pillow and features Kravet furniture, rug, fabric and trim for a sophisticated living room...somewhere where it is summer year round and has a view of the ocean and a sandy beach out the windows. 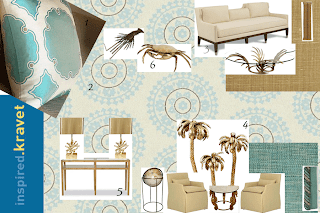 Thank you Kravet for the inspiration! Kravet items are available to the trade. Contact me if you'd like help creating a your dream living room! A wonderful place exists in Toronto. I'd never heard of this place until last week. It's a supportive place for women, with mental and emotional illness'. The George Herman House encourages a self-directed and independent lifestyle using a Holistic approach to health: mind, body, spirit. The House, while funded by Ministry of Health, it relies on donations. 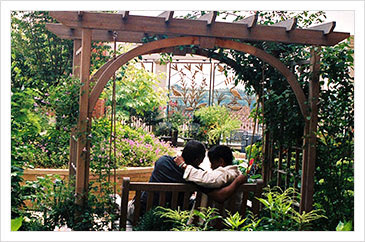 The GHH was looking for help turning their back yard in to a Healing Garden. Upon learning of this a group of bloggers in the GTA have rallied and before you know it they had IKEA Canada on board as a sponsor! So why am I blogging about this? I'm helping with the garden...for a selfish reason: because I was diagnosed a little over 2 years ago with Complex Post Traumatic Stress Disorder (C-PTSD). My options where to take medication and get in line to see a Psychiatrist or go to Guelph where they have a program specializing in PTSD. I chose to stay at home...after trying (unsuccessfully) to run away. I'm still working on getting better...it's easiest when I'm working because I love what I do. Creativity heals. The crisis, for me is over for now, but I'm just now learning that I have only made it through the depression. As I continue healing I'd like to know I'm helping others and the healing garden fits perfectly. 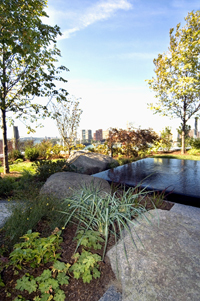 Creativity & connectivity through the healing garden. 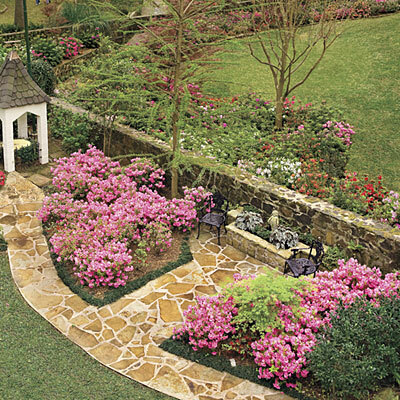 I hope to see the George Herman House healing garden full of laughing, confident, healthy women some day and I'd like to know I had a hand in it. Taste. Some people have it and some don't. Same goes for class and style. Tonight I've read a blog post by a fellow Canadian Design Blogger that saddens me. It is in a round about way bashing a Designer yet they have no first hand knowledge of what transpired. Sometimes being pseudo-anonymous behind a blog makes it's easy to natter away about others when it doesn't involve them and they were not privy to the situation. Here is the blog post doing this currently about a female Canadian Designer who is allegedly famous and on HGTV. So obviously NOT me, I'm neither famous nor on HGTV...although I'd be open to both opportunities. The problem is this: the story is told from the 3rd person perspective and important details are conveniently ignored left out yet it is rather vicious and seems to decide the Decorator was an overbearing monster. It was also sad to see the name calling of some successful designers and the innuendos as to who it could be that so wronged the clients. Honestly, I think there is far more to the story than the clients are willing to admit. It's always sad to hear clients are not happy with the service BUT I have a big problem with this story. If this was the 'big name' Decorator that it suggests there is no way the client would not have known the sofa was going to be beige. The client would HAVE to sign off on the fabric for the sofa and place a deposit before it was purchased by the designer. They would have been given detailed invoicing for the time spent and what the time was spent on. They would have known the hourly rates as they would have been in the contract. There are so many flaws to the story even if some details where left out. This sounds fishy to me. Perhaps it was not such a 'big name' decorator. There are some pretty crappy ones on TV but there is no way the handful of top Designers nor Decorators in Toronto would work the way these clients did with their decorator. There is nothing wrong with the prices they paid. For example the quality of the roman blinds are excellent. I always choke when I get the quotes from the workroom for drapery. When a client is willing to invest this kind of money they are not looking to get some drapery from InVu let alone from HomeSense or Bouclair. I'd love to see what the decor looked like after the reveal rather than the after...after...photos. 1. so the furniture, drapery etc is delivered and installed all at once therefore saving the client multiple delivery charges. 2. so the items don't get damaged, by pets, kids, etc. before the install. 3. so the client gets the WOW they are paying for! 4. items can take weeks to months to arrive so rather than having the client disrupt their lives multiple times and have missed deliveries or who knows what that can go wrong it is done in one fell swoop. AKA the reveal. *sigh* I gotta go look at some pretty blue bedrooms to feel better. In December I did a series of posts on my 2011 Trend Predictions. It was in Part 2 of the series I predicted large scale graphics on walls as murals and wallpaper. I saw a post on Tom Scheerer over on Chinoiserie Chic and my heart skipped a beat. Tom's remake of the Main Club at Lyford Cay in the Bahamas has the most outstanding wall murals (or is it wallpaper?) I've seen in some time. I'm head over heels for it. Take a peek mes petit choux! Is there nothing Tom can't do? Stunning! I knew I wanted White marble but that was the only thing I was sure of. Did I want gray, white or black cabinets? Did I want modern or traditional doors? Did I really want the organic wood trend in my kitchen or was it just an infatuation? Truth be told I've dreamed about kitchens for the last 2 nights. A Hodge Podge of kitchens and excited chatter with Christine & Meredith. Hmmm, sounds like Twitter has influenced my dream style. I blame Christine and Meredith and thank them as well for unwittingly being my design muses. Baba, stylist extraordinaire has a 20's, 30's style I greatly admire and Miles Redd has a kitchen I salivate over. 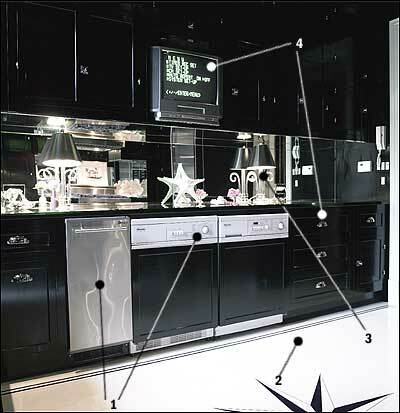 Custom high gloss painted cabinets in black(ish). Backsplash should have a matted sparkle (does this make sense) like Baba's gold lame' blouse or solid bangle. I'm thinking Rocky Mountain Hardware tile backsplash. Light fixtures will be a warm metal finish. Marble will have the 'hand' (tactile feel) of the dress. 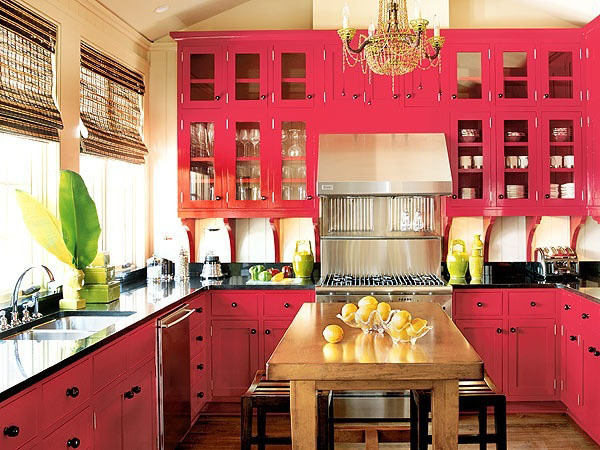 Kitchen design, I've concluded will be by Carol Reed Design (I do not have the experience designing kitchen layouts and Carol does exceptional kitchens. Some day I'll formally request her expertise! At first blush this entrance hall looks so simple. Stunning but simple. It is deceptively simple looking. Seems easy to achieve doesn't it? But look closely. This room is a study in details; look at the architectural detailing. From the wall paneling to the deep baseboards and appropriately deep crown molding. What makes this entrance stunningly warm and inviting is the layering of clean and simple furnishings over the formal, traditional details of the home. Imagine the walls bare with only standard baseboard and crown molding. The room would look cold, bare and unfinished...as if something were missing. Architectural details can not be overlooked. When you are considering decorating a room start with the walls themselves and build upon the architectural details you add. The furniture is one of the last things you need to think about. Almost an after thought. The Robert Abbey semi-flush fixture, called 'Bling', just visible at the top of the photo. It's on my list for the atrocious home we are in. The contemporary wall sconces are lovely and almost unexpected in an entrance foyer. The millwork...on my list. It will run up the stairwell, as in this photo and throughout the 2nd floor hall. These dark stained treads draw your eyes up the stairs and give a greater sense of depth to the entrance. Again, on my list. We have 'honey' oak stained stairs. Hideous! Hardwood floor, natch. We have 12'x12' ivory ceramic tile covering about 1/2 of our main floor...I'm so embarrassed! And my little piggy's are always freezing! For the suburbanites in the cookie cutter homes many of us live in this single photo is an excellent example of a jumping off point to take your blah builder basic to a show stopping shelter mag worthy home. Put the builder's model homes to shame! Show the builders and neighbours (I'm Canadian, eh.) how it should be done. As the nosey parker that I am I love that the mirror allows us to see in to the kitchen. Wouldn't you just love to live here? Nothing is over done it is simply...perfection. For the modest investment of cash and a couple of weekends of work for 2 you will always be excited for the moment you walk in the door. Sure wallpaper would look fabulous but will it appeal to a future buyer? Not likely. Wallpaper would cost about as much as the millwork but would date your home and potentially reduce the value...unlike this home. Sophisticated never goes out of style. 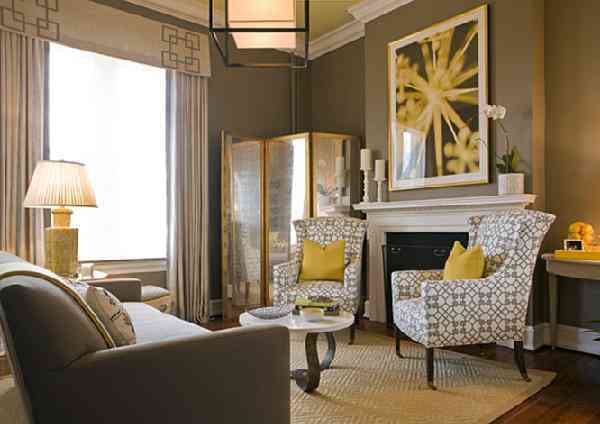 I love the yellow as the accent color to this brown palette. The ceiling sort of rounds out the room yet is unexpected...completes it don't you think? A little sunshine to brighten your day while we wait for spring.